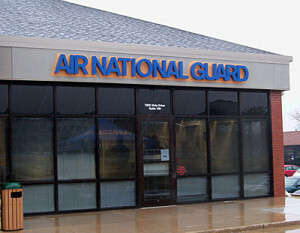 Iowa Air National Guard recruiting office. Iowa’s governor has authorized new security measures at Iowa National Guard facilities and recruiting stations. Governor Terry Branstad joins the Republican governors of Arkansas, Florida, Indiana, Louisiana, Oklahoma, Texas and Wisconsin to make the move. It’s in response to the shootings in Tennessee last week that killed four Marines and a Navy sailor. Governor Branstad has told the leader of the Iowa National Guard that he may use his discretion and arm soldiers on Guard property where personnel have not been armed before. Branstad had previously ordered the Guard to conduct a thorough review of security at all Iowa National Guard facilities and recruiting stations. Branstad is co-chair of the Council of Governors that advises the Pentagon on National Guard issues. That group is meeting Thursday in Washington, D.C. and these security issues are on the agenda. Private citizens with guns have begun patrols outside military recruitment centers across the country, and in Iowa, following the shootings at the two military facilities in Chattanooga.